Yesterday at the market I passed several large baskets overflowing with plump zucchini and noted that they were being sold for mere pocket change. Then I remembered this muffin recipe which I had yet to post and made an additional mental note to get it out into your inboxes while zucchini is still cheap and prolific. I resisted bringing home any more zucchini from the market yesterday, but my kids are so crazy about these muffins, I’m know going to need to make a double batch before long. 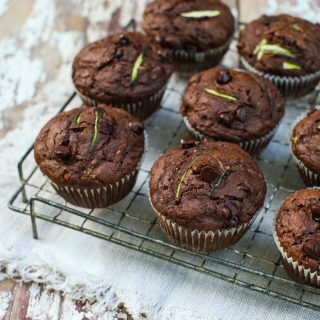 Dark Chocolate Zucchini Muffins are fantastic for breakfast or school lunches. Their flavour deepens after twenty four hours at room temperature, so they are just as delicious on the second day as they are served up warm from the oven. I’ve been making them in mini format for snacking as well as jumbo size for a filling breakfast-on-the-go. Are you ready for fall baking? Let’s kick things off with a tray of nourishing muffins. I supposed that these are technically double chocolate muffins, since both dark cocoa and chocolate chips are used. Not to worry, though, as whole wheat pastry flour and a packed cup of grated zucchini tip the scales towards a healthier muffin. I like to bake with an organic dark muscovado sugar as it deepens the flavour and is a more natural sweetener than refined sugar, but you could also use a standard dark brown sugar and get similar results. I’ve given quite a few variations in the recipe, as I want you to make it your own, with ingredients you may have on hand. Try a non-dairy version using coconut oil and almond milk or chop up a bar of dark chocolate and replace the chips. 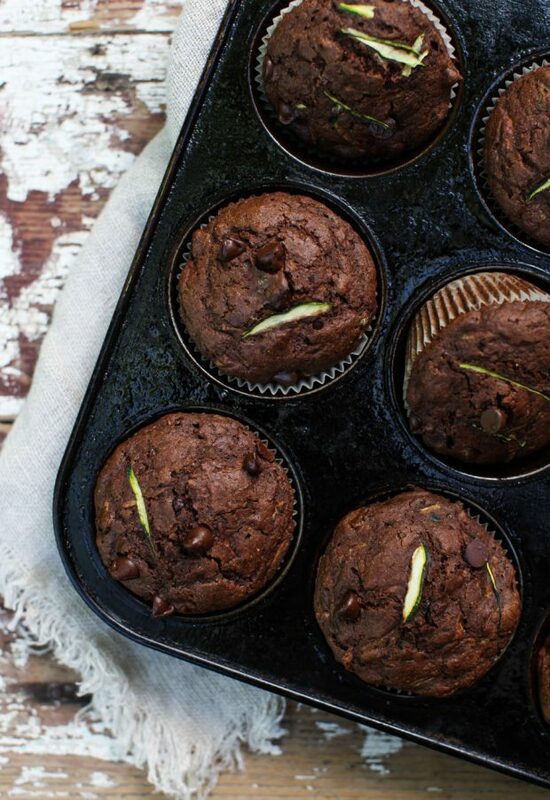 Chocolate and zucchini are a perfect pairing in this healthy, hearty muffin. Great for school lunches or for breakfast on the go. Preheat oven to 425F and place the oven rack in the center. Oil a 12-cup muffin tin and line it with cupcake papers. Over a medium bowl, sift together the flour, cocoa powder and baking powder. Whisk in the sugar and salt. In a large bowl, whisk the eggs until frothy. Mix in the oil, milk and vanilla. Pour the dry ingredients into the wet and fold together with a few swift strokes. Add in the grated zucchini and the chocolate chips. Fold all the ingredients together, being carful not to over mix. Scoop the muffin batter into the prepared muffin tin and place on the middle rack of the oven. Bake for 5 minutes, then lower the oven temperature to 375F. Bak for an additional 12-16 minutes or until the tops spring back lightly when pressed. To prepare the zucchini, first wash zucchini and then finely grate it using the large side of a box grater. Using your hands, wring most of the excess liquid from the shredded zucchini. Pack it into a measuring cup. Our very adaptable, best over oatmeal muffins remain the most popular muffin recipe in my kitchen, but these dark chocolate zucchini are a nice way to change things up. 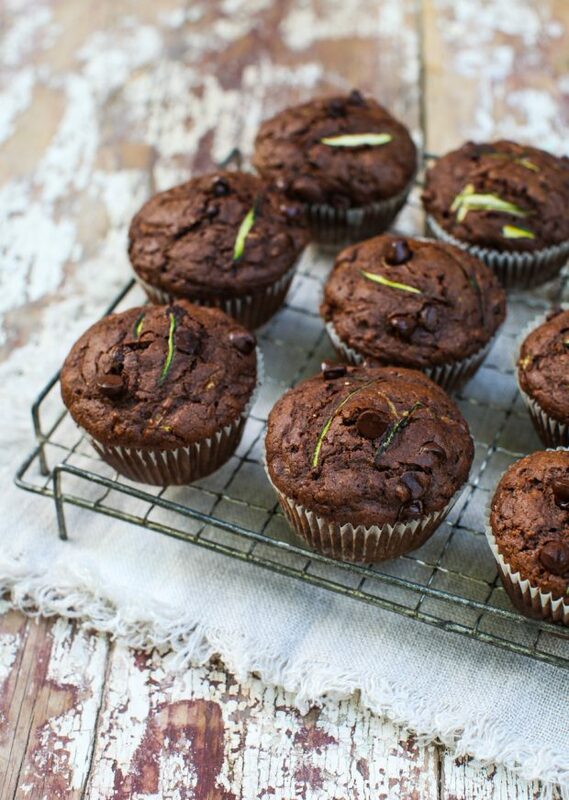 And if you don’t want to bake with chocolate, try these zucchini apple mini muffins on for size. Mm, these look delicious! I do have a question about whole wheat pastry flour though. What’s the difference between that and regular whole wheat? Can you add anything to regular whole wheat to sub it for pastry flour? As soon as I saw these I knew I had to make them asap! My daughter and I have just eaten one each hot out of the oven and they are AMAZING!! Thank you for such an outstanding recipe. I had to laugh at your comment that 1 cup of zucchini would take 2 medium zucchini. I have a GIANT zucchini on my counter at home just waiting because I know that once I cut into it, I’ll have 10-12 cups of shredded zucchini to deal with 🙂 It’s huge. I made a double batch of this recipe last month as two loaves of quick bread (I must have your recipe from UTHC!) Sadly, my children were not fans. Happily, their loss is my gain! I popped one loaf in the freezer and now have a “healthy” chocolate dessert to snack on. Hi. I made these muffins this morning and they were great but my kiddo thought that they were too chocolatey (is that really a thing?) – and I laughed cause I went light on the dark chocolate too. I loved these and am glad that I have some muffins just for me.